This article is about the company formed after the merger of Dell and EMC Corporation (now Dell EMC). For other uses, see Dell (disambiguation). Dell Technologies Inc. is an American multinational corporation in the information technology industry. It is based in Round Rock, Texas. It was formed as a result of the September 2016 merger of Dell and EMC Corporation (which later became Dell EMC). September 7, 2016; 2 years ago (2016-09-07) as a merger of EMC Corporation and Dell Inc.
Dell's products include personal computers, servers, smartphones, televisions, computer software, computer security and network security, as well as information security services. Dell ranked 35th on the 2018 Fortune 500 rankings of the largest United States corporations by total revenue. Approximately 50% of the company's revenue is derived in the United States. 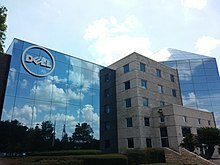 Dell also owns 4 separate businesses: RSA Security, Pivotal Software, SecureWorks, Virtustream, and Boomi, Inc.
On October 12, 2015, Dell announced its intent to acquire EMC Corporation, an enterprise software and storage company, in a $67 billion transaction. It was labeled the "highest-valued tech acquisition in history". In addition to Michael Dell, Singapore's Temasek Holdings and Silver Lake Partners were major Dell shareholders that supported the transaction. On September 7, 2016, Dell Inc. completed the merger with EMC Corp., which involved the issuance of $45.9 billion in debt and $4.4 billion common stock. The Dell Services, Dell Software Group, and the Dell EMC Enterprise Content Divisions were sold shortly thereafter for proceeds of $7.0 billion, which was used to repay debt. In October 2017, It was reported that Dell would invest $1 billion in IoT research and development. Dell Inc. had returned to private ownership in 2013, claiming that it faced bleak prospects and would need several years out of the public eye to rebuild its business. EMC was being pressured by Elliott Management Corporation, a hedge fund holding 2.2% of EMC's stock, to reorganize the unusual "Federation" structure, in which EMC's divisions were effectively being run as independent companies. Elliott argued this structure deeply undervalued EMC's core "EMC II" data storage business, and that increasing competition between EMC II and VMware products was confusing the market and hindering both companies. The Wall Street Journal estimated that in 2014 Dell had revenue of $27.3 billion from personal computers and $8.9 billion from servers, while EMC had $16.5 billion from EMC II, $1bn from RSA Security, $6bn from VMware, and $230 million from Pivotal Software. EMC owned around 80% of the stock of VMware. The acquisition maintained VMware as a separate company, held via a new tracking stock, while the rest of EMC were rolled into Dell. The acquisition required Dell to publish quarterly financial results, having ceased these on going private in 2013. Dell Technologies has products and services in the field of scale-out architecture, converged infrastructure and private cloud computing. On January 29, 2018, it was reported that Dell Technologies was considering a reverse merger with its VMWare subsidiary in order to take the company public. On December 28, 2018, Dell Technologies became a public company. ^ a b c d e f g "Dell Technologies Inc. 2018 Form 10-K Annual Report". U.S. Securities and Exchange Commission. ^ a b Shah, Agam (September 7, 2016). "The new Dell Technologies: 6 things you need to know". PC World. ^ "Fortune 500: Dell Technologies". Fortune. ^ "Michael S. Dell, MSD Partners and Silver Lake Lead Transaction to Combine Dell and EMC, Creating Premier End-to-End Technology Company" (Press release). Business Wire. October 12, 2015. ^ "Dell agrees $67bn EMC takeover". BBC News. October 12, 2015. ^ "BOOM: Dell to Acquire EMC for $67 Billion". Sovereign Wealth Fund Institute. October 12, 2015. ^ "Historic Dell and EMC Merger Complete; Forms World's Largest Privately-Controlled Tech Company" (Press release). Business Wire. September 7, 2016. ^ "Dell Technologies creates new IoT division as part of three-year, $1bn investment". businessreviewusa.com. Retrieved 19 October 2017. ^ "Michael Dell Vows to Invest $1 Billion over Three Years to Fund Internet of Things Business". Fortune. Retrieved 19 October 2017. ^ Moorhead, Patrick. "Dell Technologies IQT: Doubling Down On The Internet Of Things". Forbes. Retrieved 19 October 2017. ^ "Dell Makes Case to Go Private in Grim Filing". The Wall Street Journal. March 29, 2013. (Subscription required (help)). ^ "Elliott Management Sends Letter to Board of Directors of EMC Corporation" (Press release). Business Wire. October 8, 2014. ^ a b "EMC Takeover Marks Return of Michael Dell". The Wall Street Journal. October 13, 2015. ^ "Dell-EMC: The empty shop". Financial Times. October 12, 2015. ^ "Dell agrees $63bn acquisition of EMC". Financial Times. October 12, 2015. (Subscription required (help)). ^ Womack, Brian (October 21, 2015). "Dell CFO Reluctantly Accepts Public Disclosures With EMC Deal". Bloomberg L.P.
^ "The merger of Dell and EMC stems from the rise of cloud computing". The Economist. October 12, 2015. ^ "VMware Plunges on Report It May Acquire Dell in Reverse Merger". Bloomberg L.P. January 29, 2018. Retrieved 29 January 2018. ^ "Dell returns to public markets after 6 years". Reuters. Retrieved 28 December 2018.